Continuing to lead the way in fast and efficient road surfacing, Aggregate Industries’ Contracting division recently laid a whopping 1,800 tonnes of an ultra-low noise asphalt at Brampton Hut Services in Huntingdon in one weekend alone. 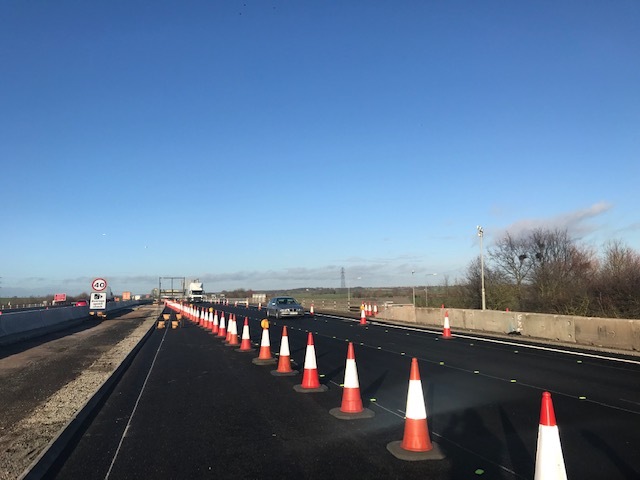 Section 1 of Highways England’s A14 Cambridge to Huntingdon Improvement Scheme will see 13 miles of the road upgraded to three lanes in each direction and is expected to cut journey times by up to 20 minutes. The pavement works at Brampton Hut motorway services specified minimum sound level requirements of -7.5db (A). These limits are designed to curb noise pollution generated by the new road across built-up areas. To satisfy stringent noise restrictions on the UK’s largest road improvement scheme, Aggregate Industries suggested the use of its 10mm SuperThin asphalt, which at 7.8db(A) by far exceeds the minimum sound level requirements, rather than the -3.5db(A) associated with traditional hot rolled asphalt (HRA). As the only supplier on the market to currently offer a HAPAS-approved ultra-low noise asphalt, Aggregate Industries is expected to lay approximately 30,000 tonnes of SuperThin across the A14 contract, which is due to complete at the end of 2020. So far, the team has already laid 2,200 tonnes of SuperThin. In addition, the company’s industry-leading technical experts in surfacing will be on hand to ensure all work is completed efficiently and to the highest quality standard possible in order to minimise disruption to the public. Paddy Murphy, Director of Contracting at Aggregate Industries, said: “As the sole pavement contractor and supplier to the UK’s largest and most prestigious road improvement project, one of our key aims is to help reduce the impact of operations on the local community and the network.